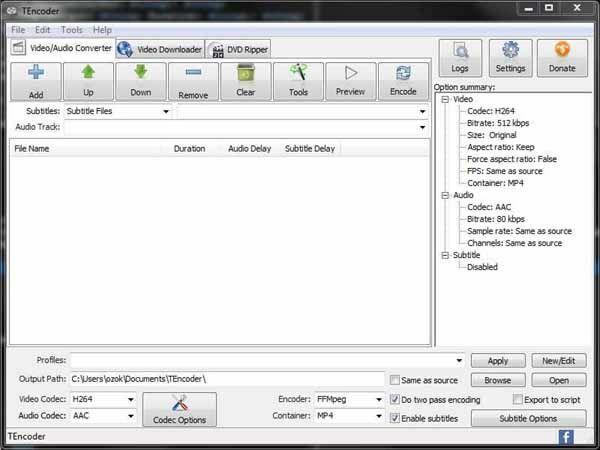 Download latest version of TEncoder Video Converter free. It is an open source so obviously free of cost for all. TEncoder Video Converter provides the facility to its users that they can convert both audio and video into a large number of formats. This detailed suite provides large batch renders and many customization options as an added bonus the users can overlay and edit subtitle files on any video. To easily transfer media files this program is the ultimate package. Through this app users are able that they can import single files, folders or whole file trees to convert. The users will find that there is a list of file will appear in the middle of the program and can be quickly so ted or edited. On the right will be several drop lists which will allows the users edit a file’s attributes. Ten Coder Video Converter can change codec, aspect ratio and frames per second for video. For audio users adjust codec, hertz, bitrates and number of channels. It allows the users that they can also alter the file container and encoder. This nice program has the ability to support all the common formats like AVI, 3GP, MP4, AAC and many more. For further edit users’ video and audio files this program has an addition host of options before rendering. The users can opt to use from one to eight encoders simultaneously when they finally do render with this app. In TEncoder Video Converter rendering single videos is generally fast and the finished file will be an excellent to decent quality. The users can set up large batch renders for longer jobs and multiple videos.